I spend a lot of time thinking and writing about the “in-between” time: those moments between the milestones that add up to a life. I believe it’s important to live in the moment, to be present and to pay attention to the people you’re with in order to truly enjoy life. But this past week, I got a lesson on just how meaningful those milestones actually are. The holidays fell mid-week this year, which translates to lots of people taking time off and not much work being accomplished. For me, this slowdown felt unnatural. It was too quiet for my taste, so I found myself wanting to fill up my weekend with activities. I had to go, go and GO. So, I told the Hubster I wanted to take Jake out to learn to ride his bike. I didn’t know how quickly he would. I sat on the ground at the neighborhood school’s parking lot and watched him wobble up and down the blacktop. Jake was nervous. He didn’t think he could do it. Steve let go, and Jake made it across the parking lot on his own, yelling “FREEDOM” as he pedaled. Tears of joy started streaming down my face. Milestone #1, and I didn’t have a camera. The next day was Sunday, and we decided to try the outdoor ice rink at 8AM. It’s a limited time thing here in sunny SoCal, after all. So we bundled up the kids, signed our rights away and stepped onto the ice (I brought the camera this time). They careened into walls and took a lot of falls, but after 30 minutes, Jake was skating alone across the ice. He skated towards freedom, and rather quickly, I might add. Milestone # 2, and I only managed a 30 second video on my cell phone from the first few minutes of the adventure. Day 3. I’m back to work, immersed in a project, and the cell phone beeps. The Hubster has sent me a video. What do I see? Jake has now managed to learn to skateboard back on that blacktop. He looks mighty cool decked out in his safety gear. Milestone # 3, and I missed it entirely. I couldn’t really sleep that night. Something happened in those few days. Steve and I laugh and say it was a big week in the life of Jake – one we will remember for a long time. It was a big week in our lives too. In the past three days, my son had his first taste of freedom, as I called it. 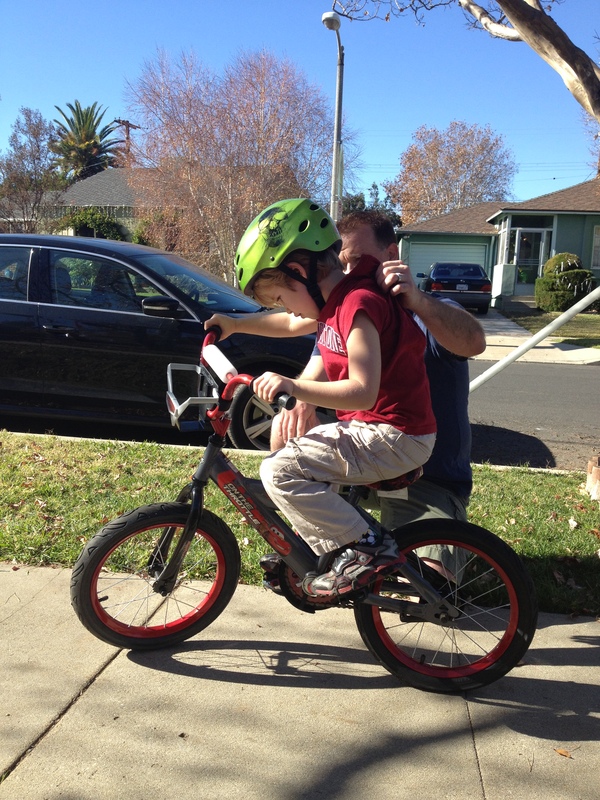 In those same three days, as I watched my son pedal towards freedom, I also watched him ride away from Steve and me. I am so proud of what he has accomplished so quickly. And I can see so clearly how short our time with him will be under our roof, implicitly trusting us and naturally following us. This week, Jake led us. We ran behind, our arms outstretched. Wanting him to stand on his own. Wanting our baby back and knowing that time is almost over. I learned this week that milestones are big. They may come quickly when you least expect them. They won’t come again. Be prepared. Bring your camera. Ready your heart.